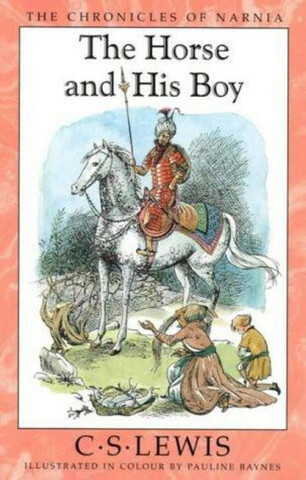 So back on the Chronicles of Narnia, and the book that I never managed to finish when I was younger: The Horse and His Boy. I seem to remember picking it up at some point, but it can't have made a huge impression at the time, seeing as I managed to forget that half of the main cast existed. This time I was paying more attention though. The Horse and His Boy follows Shasta after his fateful meeting with a talking horse. Trying to console himself when he overhears the man who had raised him preparing to sell him into slavery, he discovers that his would-be master's horse, Bree, is from Narnia. Kidnapped as a foal, Bree has been longing to return to his homeland for as long as he can remember, but has never had the chance due to the oddity of being a warhorse without a rider. Without a moment to lose, they find themselves travelling north across the great desert at the edge of the Kingdom of Tashbaan, meeting with more runaways as they go. I want to like this more than I do. In many ways The Horse and His Boy is a solid fantasy adventure. There are battle scenes, races across the desert, daring escapes and, seeing as it is a Narnia story, some magic courtesy of Aslan. That all works quite well, the battle scene towards the end being the main exception (it's odd reading about a battle in the style of football commentary is all I will say on the matter). There is one thing though that makes the whole thing just a little bit uncomfortable: it does feel more than a little bit racist. You have the fair-haired, pale-skinned boy running away from the corrupt, tyrannous and warlike empire that would see him become a slave, all full of dark-skinned people would you believe. Even the main character native to Tashbaan doesn't excuse this, as it pulls the trick that a lot of medieval European texts did: find an example of a noble individual of this Other culture, an exception if you will, then have them renounce their former culture. It makes the whole experience quite skin-crawlingly uncomfortable. I liked Aravis at the beginning, when she had the attitude of an arrogant princess despite her desperate situation trying to escape a loveless match with a man old enough to be her grandfather. But by the end, you can see her disappearing into this new culture like her former country didn't exist and it just doesn't sit right with me.